Taylor Swift is in hot water right now after dipping her toes into Nicki Minaj’s twitter race rant yesterday (Nicki has a point though). Media outlets took note of Taylor’s actions and American’s Sweetheart is in the middle of a backlash. This, however, has been boiling for the past few weeks. After criticizing Apple Music for not paying artists during the service’s trial period, photogs criticized Ms. Swift for almost doing the same thing. Fusion also ran an article on Swift’s seemingly deep veneer cracking exposing something different from her sweetheart/bestfriend demeanor. Days after, Gawker posted a piece attacking the issue head on–Taylor Swift’s using faux-feminism to get your money. Nothing could be more poetic than this build up. Did we not take heed? And yes, Katy Perry has indirectly confirmed that this regarding Taylor Swift. What Katy Perry is talking about is the Queen Bee version of Cady. Okay, so I’ve made some points, but what can we get from all this? Taylor Swift has yet to make a statement regarding the controversy and has even deleted her tweets to Nicki Minaj. Well, if this analogy holds true, we can somehow infer using Mean Girls’s storyline what Team Taylor’s next move is. So what can happen? Taylor will win the Video of the Year Award for “Bad Blood”, she’ll acknowledge her change in image in her thank you message. She’ll become a mathlete and will answer the last question to win the competition. I’m not sure about the fourth one but who knows, the limit doesn’t exist for someone such as Taylor Swift. My Way has left a lasting imprint in pop culture. It was a french song repurposed by Paul Anka (known for Put Your Head On My Shoulder and co-writing Love Never Felt So Good with MJ and JT) for Frank Sinatra. It has been covered by artists such as Elvis Presley, Nina Simone, R. Kelly and has been sampled by Jay-Z. In addition, it was once used by Sesame Street for an anti-littering segment. Its popularity, nonetheless, has also permeated into Filipino Pop Culture, being a staple song during Sunday jukebox hits on radio as well as in videoke bars…well until in recent years. Some videoke bars have banned My Way or removed the song altogether from their song catalog. Why? Because the song has purportedly started bar brawls, or much worse, deaths. Sorry netizens, but it’s not because of the devil; Karaoke Rage is a real thing. As what an article from Slate has pointed out, “karaoke bars bring together several socially combustible elements…fill a room with 30 or so exhibitionists, ply them with alcohol…and it’s only a matter of time before all the forced interaction results in conflict.” What this just means is that brawls are something to expect from public karaoke. However, us asians one-upped the whole Karaoke Rage thing by crossing onto murder territory. There have been reports of Karaoke Rage in Malaysia, Thailand and China; all leading to deaths. But these reported murders are isolated cases. No pattern can be established, no single song can tie the incidents together in each country. And this is where we differentiate ourselves from other Asian countries. Our murderous karaoke rage, more often than not, involves My Way. 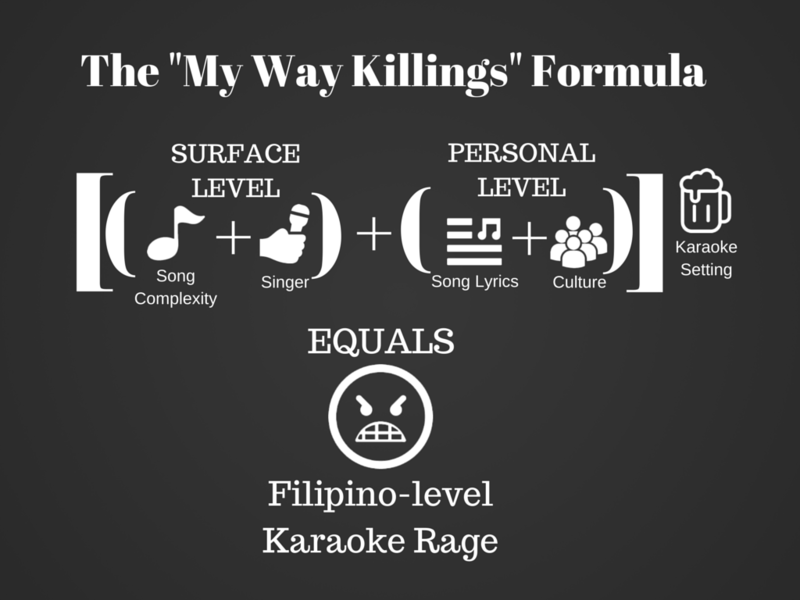 And as what Lourd De Veyra reported in his Word of the Lourd episode on it, there are roughly 70 cases of murderous karaoke rage that involved the song. We Filipinos have transcended asian-level Karaoke Rage. Isn’t that a strong enough case to stake our claim as the one true heir to the Iron Karaoke Cabinet? I say these are valid hypotheses. But I feel that each hypothesis isn’t enough to explain the whole phenomena. Moreover, I feel there’s something missing in the explanation. Most especially, why do people get irked by the lyrics of the song? The closest explanation from the article is that Filipino culture is innately violent. I would agree to some degree, although it still does not explain what explicitly triggers this extreme reaction. I believe these are pieces of a big puzzle and it’s still missing a piece. What I’m proposing here is that My Way can affect a person on the surface and at a personal level. And these reactions are further heightened by the alcohol and the karaoke setting…that then results to Filipino-level Karaoke Rage. SURFACE LEVEL: Did the singer give justice to the song? Song Complexity: My Way is a pretty hard song to pull-off. Especially when you want to imitate Sinatra’s voice. My Way is deep and low at verses but high and full in the chorus. Singer: Singing ability comes into play. It’s a bad enough experience to listen to an off-key singer in public karaoke. Worse, when the person has the gall to sing one of the Philippines’ karaoke anthems. Imagine, Luis Manzano singing the national anthem and you can’t do anything about it. You just have to watch him butcher the national anthem knowing quite well that you can do a goddamn better rendition. Oh and you’ve had a couple of beers already. Wouldn’t you want to stop the guy mid-song and punch him in the face? These three factors alone constitute regular Karaoke Rage. You just want to beat the guy because he’s an awful singer or he’s been hogging the mic more than three songs in a row. But how do we level-up the Karaoke Rage? CULTURAL LEVEL: As a Filipino, how do I connect to the song? Song Lyrics: As what was mentioned in the New York Times article, My Way’s lyrics have a triumphant tone to it. My Way came from his 48th studio album. Anka intended it to be a celebration of Sinatra’s long and successful career. With lines like “Regrets, I’ve had a few; But then again, too few to mention” and “But through it all, when there was doubt, I ate it up and spit it out.” you’d think Sinatra initially popularized YOLO. Lines like those gave the song its flair and bravado. Culture: This is what I feel was missing from the earlier explanations. How much a person’s culture affects their interpretation of the song. Probably for western cultures, where individualism is celebrated, the song speaks differently to them. No wonder My Way was the top preferred funeral song in the UK for seven straight years. My Way is to celebrate one’s death and not be the cause of one’s death. But for us Filipinos with our collectivistic roots, this may not be the case. Filipinos highly value harmony and the sense of community. We feel success cannot be achieved just by an individual’s efforts. Success for us is a collective effort. 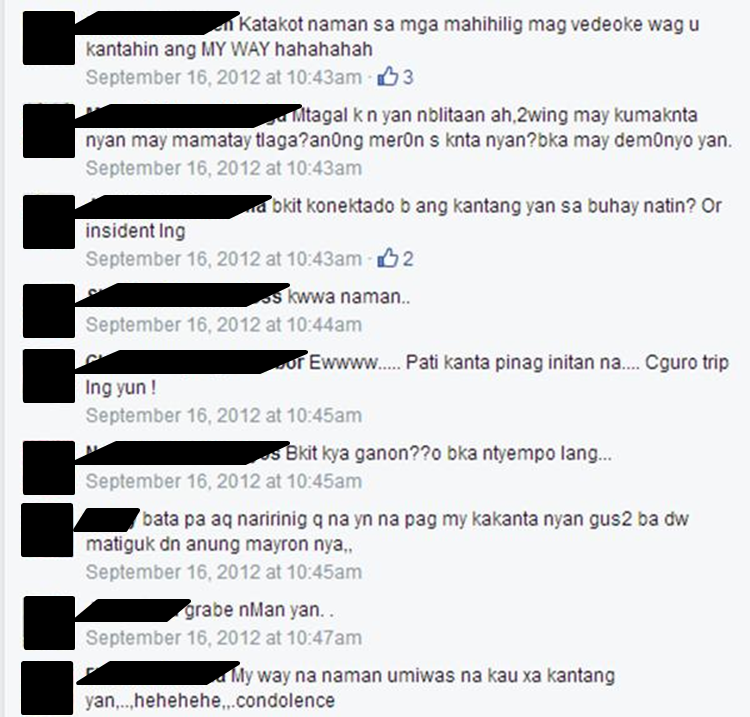 This stresses why we have concepts of bayanihan and utang na loob. If we ever celebrate success, it has to be in a collective perspective We label those who fail to acknowledge the effort of the collective as ingrata or hindi marunong tumanaw ng utang na loob. So if we use this collectivistic lens in viewing My Way, we can interpret its celebration of the self as arrogant, egotistic and self-important. And we attribute these characteristics to whoever is singing the song (especially when you’re already drunk).So imagine, Luis Manzano singing a song about his successful showbiz career. Singing about his achievements but without even acknowledging his fans or the fact that he’s the son of two showbiz mainstays. Wouldn’t you feel that he’s proud? egotistical? self-important? This is what I feel triggers the “arrogant” hypothesis. We reach heightened levels of Karaoke Rage when the core meaning of the song doesn’t jive with the core qualities of our culture. No, My Way is not cursed nor is it demonic. It is brought about by numerous cultural and circumstantial factors. Trying to crudely simplify it, it is a combination of a disconnected song, an awful singer and a lot of alcohol. Is there a way to stop the My Way Killings? I feel some measures are already in place in preventing the My Way Killings. Like what the New York Times mentioned, some videoke bars hire gays as hosts to diffuse heated situations before the knives and guns come out. Banning or deleting the song from the catalog is considered a last resort. Will The My Way Killings ever end? I feel there is an eventual end to the My Way Killings. However, since the killings are a result from a cultural reaction, ANOTHER SONG can take its place. Who knows when the next My Way will happen.